This entry was posted in events and tagged bea bloggers conference, book blogger convention by janicu. Bookmark the permalink. Great recap! Much of what you felt I did also. And as always, it was great to see you again :). Don’t get me started on the food at BEA Blogger Con. Blerg. I was considering mentioning the food, but thought I had complained enough! Thanks, I always like seeing you. We really should do a Strand trip like Christine says. 🙂 Best part of this all was seeing everyone. This was my first BEA & Blogger Con, and like you, I wish there had more opportunity to get to know other bloggers. Meeting & learning from other bloggers was my whole reason for going in the first place. So yeah, that was disappointing. And I was at the monetizing panel too. All the self promotion, especially from the moderator, drove me nuts. I’m still glad I went, but it wasn’t what I was hoping it would be. I really had a different reaction to this one than previous ones. I wondered at first if I was being too picky, but everyone else I asked seemed to share my reaction, which makes me feel like I’m not crazy. I wish I had gone to the Uncon, but I would have missed all the book bloggers who were at this conference. I’m really going to have to weigh my decision next year. Great post! I’m glad you mentioned both the registration and that moderator, the “Click Millionaire” guy. Ugh. I almost feel like they need to specify FICTION to get rid of the Dummies and Entrepreneur types. One of the best things about the conference was finally getting to meet you. 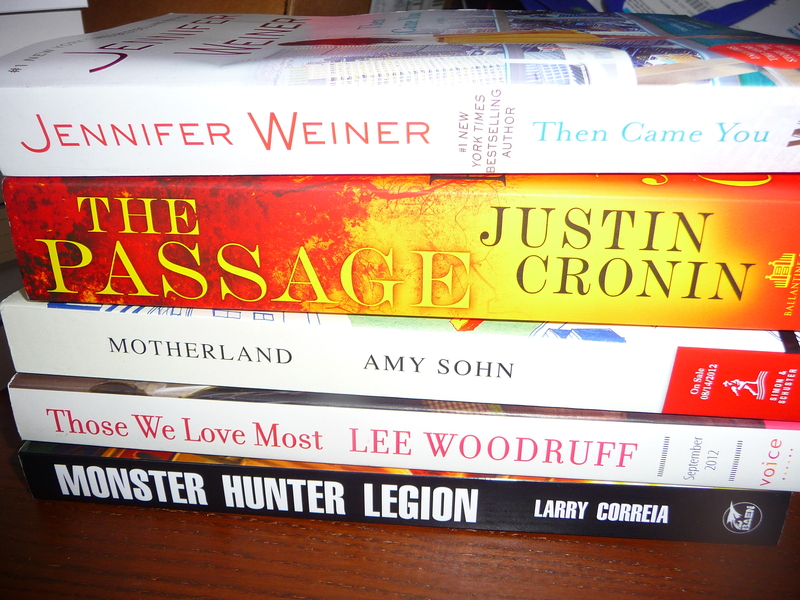 And I had a much better time at BEA than BBC too. Look forward to your recap of that. I thought that he did well moderating that panel, and I suppose it’s not his fault we had already been subjected to enough promotion that day, but yeah. When that lady scurried down to win a copy of his book I thought “Is she a friend of his?” but then she just wanted to promote her book too! It wouldn’t end! I would love to see panels that were specific to genre, but I am not going to hold my breath for Romance or SF, the way they are usually represented at BEA. We’re much more likely to get a YA-specific panel. Which is another I would go see, actually. I was always jealous when reading people’s recaps for BBC and BEA because it looks so fun to be able to meet a bunch of like-minded people who like reading as much as I do and to just get to talk to a bunch of people who understand and like book blogging (I don’t have any friends in my “real life” who book blog or know anything about it). But after reading all these recap posts for the new BBC, it looks considerably less appealing. It irritates the hell out of me that book bloggers are seen by so many as nothing more than promotion, and that’s ALL we should be. Just, uugghh. Anyway, I’m really looking forward to your BEA recap. (: I’m glad that at least that went well! It is kind of funny because as book bloggers live tweeted the event, those who weren’t there were saying something similar! Sigh, the rest of BEA was a lot more fun, really. Also, I received a phone call relating to books too! Mine wasn’t about promotion though; or maybe I cut off the person’s inspiration when I said that I wasn’t a journalist and that no, I didn’t read children’s books. Oh well. *shrugs* I didn’t think much of it since I already receive promotional postcards for random books once BEA rolls around. It’s kind of nerve-wracking that our info might be released for these kinds of things…the publishing world needs time to get used to us, I think. Ha, thanks. I agree – there were some good experiences in there, for sure, and I did see people I wanted to see. I really wanted to go to this last year and this year, but wasn’t able to. After reading your detailed description of the day I’m glad because it sounds disappointing. I don’t know if I have super high expectations, but I want relevant, books specific panels. Hopefully next year they’ll apply changes and bloggers will have a better experience. On a side note, I’m glad you got to meet up with some pals. If you ever go, we need to exchange numbers to meet up! Yes, the panels at the book blogging cons have been about book blogging in general, not really about one genre. During BEA however, there ARE panels that are about certain genres – like I went to one which was about Weird Fiction, and there are Editors buzzes focusing on MG and YA etc. Part of the reason I didn’t attend BBC, was that I found the whole registration process very confusing. I didn’t understand how to register, or what I was supposed to register as, so when my local library association posted the chance to register for BEA at a discounted group rate, I decided to go with that. It was nice because I just sent my association my info, and they did all of it for me. Problem solved! I am fairly appalled at BEA giving out blogger’s home phone numbers, as well as the fact that they are asking about stats. I get so frustrated when this happens, as honestly some of the biggest blogs have the weakest content. I really appreciated hearing from authors and publishers at BEA who stated clearly that they care more about enthusiasm and well-written content then numbers. Following along on Twitter, I was one of those who became glad that I hadn’t bothered with BBC. I would have liked the opportunity to connect with other book bloggers, but I don’t like feeling like a captive audience member that is being marketed to when I came to learn and have a productive conversation. The lack of actual book bloggers on panels was really disappointing to me in particular. I blog because I like being part of a community, and I genuinely enjoy promoting books that I feel deserve more attention. I don’t like feeling pushed into a marketing machine, and want to stay away from aggressive campaigns (Insurgent anyone) that seem to have publishers all excited. 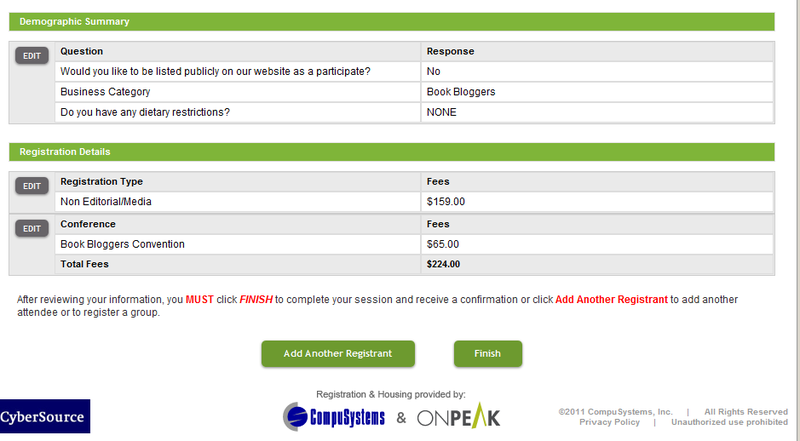 Wow, the registration process was so bad you didn’t register for the BEA bloggers con! That’s pretty bad. I think the website needs testers. I have seen links that don’t work quite right and obviously they should have had someone do a trial run of registering. The stat thing seems to keep coming up, and ok, it is an indicator, but for something like a blogger’s con, it should not be a gating factor. And asking people to put up their stats for a directory? So my stats can be compared side by side to others? Hrr. I probably should have gone into this in my post, but last year there were surveys at the end of the BBC, and apparently people had said in this survey that they wanted more chances to meet authors and more networking (link). BEA went above and beyond to get that, but it overbalanced the conference so it felt very marketed. Somehow there needs to be a way for people to met PR/authors if they want, and a way to just talk with other book bloggers about blogging without feeling like we’re being listened in on. Some bloggers who had been around also felt like they were being told things they already knew and wanted a “newbie” book blogger track and a “experienced” book blogger track. On the positive side – Monday was a better day for the con than Friday was, and they did well in making the sessions shorter (1 hour was good). Excellent post! Wow, I knew you had a horrible time with registration but I didn’t realize someone called your home phone number to pitch their book. That’s terrible! The blogger conference was very disappointing this year. I’m also going to wait before deciding whether or not to go next year, and I’ll also be considering the UnCon if they do that again. Thanks. Yes, a horrible, horrible time! The adrenaline coursing through me in dealing with calling was just.. ug, not good for my mild anxiety. No one called you? I must understand the deal with who got called and who didn’t. No one called me, but I also signed up late this year. They never even included my name on the attendee list on the site. I think I may have signed up late enough to avoid the worst of it! Just to add a data point…someone called me on my cell as well. In addition to getting several emails a day from people selling everything from clip on lights to puzzles to books. I learned I needed to “opt out” too late. It should have been made clearer. It’s been really interesting reading about people’s experiences – thanks for the write-up. I’d love to go to BBC/BEA one day (though maybe less so for the former now!). It’s a real shame that the BBC didn’t appear to work for anyone – hopefully they’ll listen and make it work better next time. I hope so. There’s a whole year to plan now and hopefully Reed will be listening to attendees suggestions for improvement. I ended up leaving after the lunch. Blogger Con was not for me. Also, I was incredibly hungover, which was totally my fault, ha ha. But seriously, I thought the keynote was awful, I ended up putting my head on the table and zoning out because I legit don’t care about Oprah or the New York Times. I was not too terribly into the speed dating pitches. AND OMG would it have killed them to give us water or orange juice for breakfast? I did like the wraps for lunch. I sort of wish I had signed up for the Uncon instead, as I’d rather chat with bloggers over issues I care about like DNFs and all that. ALSO REGISTRATION! What a nightmare. Hah. Well that must have been a pretty sucky morning for you! I would have loved some cold water – I think someone was asking if they had ice water, but they only seemed to have hot water for tea. OJ would have been great too. I liked the lunch better (at least there were chips and a cookie), but I’m not a fan of wraps in general so I couldn’t eat more than 1/4 of it. I was starving by the end of the day. Understandable! 🙂 Yes, I think if it weren’t for hanging out with you guys and meeting other people, I would have left even earlier than I did. Wow, that’s some screwed up registration! You know, I think bloggers should be editorial, but the convention changed their minds when they saw probably hundreds of bloggers wanting to attend and saw $$$. Can’t have them all go for free, can they? Even if they cover the show? The more I think about it the more I’m kind of angry about it, but maybe not surprised in how it turned out. Yup, registration was bad for me. I don’t know what the price should be or if it should be free, but I just want it to be consistent and clear. Not one price on one page, then another price on the next, and then have some additional fee on top that I don’t understand and neither does customer service. That’s what you expect when you are doing any sort of transaction – just to be able to buy something without having the price changing under you as you buy it. Instead, their website was a disaster. Anyway, I discussed this with my husband who is more objective about it than me and he feels like they’re allowed to make mistakes with registration the first time they take over and I need to chill. Ha. I sort of was not focusing on it, until the actual con I guess. It was so disappointing it made me relive my registration woes. I think I’m even happier with my choice…not going this year after I saw the agenda. I was going to come up to NYC for the Book Blogger Con day, but I chose not to after seeing the panels and lack of book bloggers on the panels. Next time I will definitely wait till I see an agenda before I think about registering. Yes, I find that’s the best policy with these conferences. No problem. Well, I’m not saying don’t go, but maybe wait until there’s an agenda before you decide whether it will be useful to you. Pingback: Books, Bloggers, and Blisters: BEA « alita.reads. This is a great post. I was also going to do a post on how to register for BEA, but something held me back, it was so confusing. Then we started getting e-mails about how we were denied. You seemed to have much more trouble than I did and for that I’m sorry. I’m also sorry you were disappointed in the day. I was a bit happier with the experience, but yes, I do see room for improvement. Oh yeah and the food was horrible. Thank you. Yes, it was very confusing. Well at least I wasn’t denied (were the denials only for the bloggers who registered as Press? I was confused about that but that’s what I assumed). There’s no reason to be sorry! I’m glad you had a better time. Awesome post, Janice! Took me a while to read it because of life, but it wasn’t a post I wanted to skim. I’ve never been to BEA and I don’t think I’ll ever have that opportunity, but the book blogger conference does sound like it was disappointing this year. I heard about that comment about “mature” bloggers on Chrisbookarama and I agree with you: some publishers seem to be wanting to control what book bloggers do and say, forgetting that we don’t actually work for them and this is more of a hobby than anything, no matter how important it is to us personally – I don’t think it’s all publishers and I guess the can’t stop their publishing/book selling perspective, but you’re right: there needs to be a stronger voice on behalf of bloggers and the fact that we were so under-represented is a shame. The topics sounded so interesting too! I’d be annoyed at the constant self-promoting as well. I love hearing anecdotes from authors about their books and the process of getting published etc., but if I feel like I’m being hit over the head with a “buy my book” message I would never want to read it! This sounds like an expensive trip overall – it’s in New York too right? Not a cheap place to stay in I’d imagine. I’m shocked that you got that marketing call. Even if we do blog mostly for our own enjoyment, cannot the industry have a bit more respect for us and treat us accordingly? 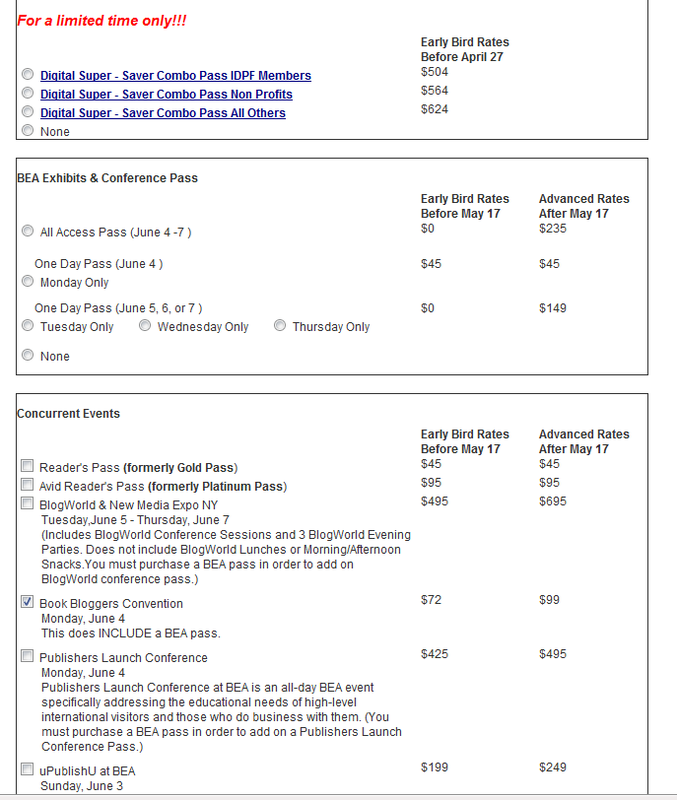 I am not sure I would blame publishers so much as the BEA bloggers conference organizers who didn’t seem to think that there would be a problem in inviting/allowing so many non-book bloggers to a conference for book bloggers. Nothing against publishers, PR people, and authors, but this was a book blogger conference. If they wanted a chance to pitch to us, I’d prefer that limited somehow so I’m not pitched the WHOLE conference. I also hated that I felt like I couldn’t just talk book blogging with people. Like there were too many other people there with a different agenda, listening in and/or hijacking the conversation. The organizers just completely missed the mark by allowing so many non-book bloggers in both as attendees and as panelists. The cost is certainly cheaper for people who live in the area and within say 500 miles. I know bloggers that saved money by having a roommate and sharing a hotel room or traveling down via bus or train instead of plane. I am lucky that I live 40 minutes away from NYC by train so on top of the BEA price ($72 for me), I paid for train ($21 round trip a day), and taxis (about $10 ea way). I probably spent like $170-$180. I brought my own lunch except on the day it was included, and there was one day I got back to the train station via the free shuttle instead of taxi, one day I took the subway (after a dinner elsewhere in the city, $2.50 a ride I think it was), and one day that I walked. If I added hotel to that, it can go from $100 to up to $300 a night. I would say you probably could save on transport by staying in a hotel nearby (walking distance would be good) and rooming with someone, but it still would cost some money. With the cost of airfare from outside the US on top of that – yeah that’s going to add up cost-wise. Yeah as I thought, that kind of price tag definitely rules me out! 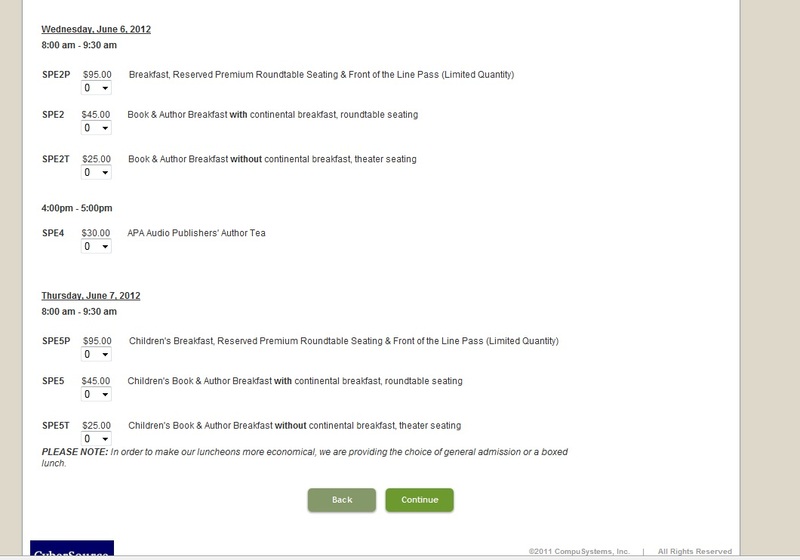 I just read online – curious about what we have on offer here – and discovered that Reed Exhibitions also bought Book Expo Toronto and the Toronto Book Fair in 2009 – and then cancelled both, saying they were going to focus their efforts on one singular North American book event, BEA in New York. I remember going to Book Expo Toronto in 2006, when I worked at a small publishing house – it was only for booksellers and librarians and a few other industry types, but it was still pretty cool and when I took breaks from our stall to walk around I too scored books and got to meet some authors, like Lynsay Sands (that was my first intro to her, in fact!) and Guy Gavriel Kay. Other than that, we still have Word on the Street, which is a pretty big book fair in September (you can get cheaper books but nothing for free, and there are authors there like Kelley Armstrong and Robert J Sawyer), and the Harbourfront Authors Festival, which I’ve never been to, and Polaris which I went to once thanks to wonderful Anna (Genre Reviews) – I’d like to go to that one again, it’s in July, though again it’s not a place where you get free books but there are great panel discussions and I got to meet Lesley Livingston and RJ Anderson and Michelle Sagara West. It’s a bit of a slog to get to though! So we don’t have anything like BEA – the big publishers pulled out of our Book Expo which I think was the deciding factor, but it means the smaller presses have fewer avenues to get the word out about their authors, which is a real shame. As usual, the big names in the industry pretty much have their way!